You have walked, biked or drove across it. You may have sailed under it. The Northern Avenue Bridge is more than a transportation link connecting Downtown to the Seaport and Fort Point, it is an important part of the historic fabric that characterizes our Fort Point neighborhood. It inspires and graces numerous paintings by Fort Point artists. It is a tourist destination for visitors wanting to experience the operation of a historic swing bridge, imagining the era when the Fort Point Channel was full of commercial vessels. It can be preserved and adapted for the twenty-first century. It's true! 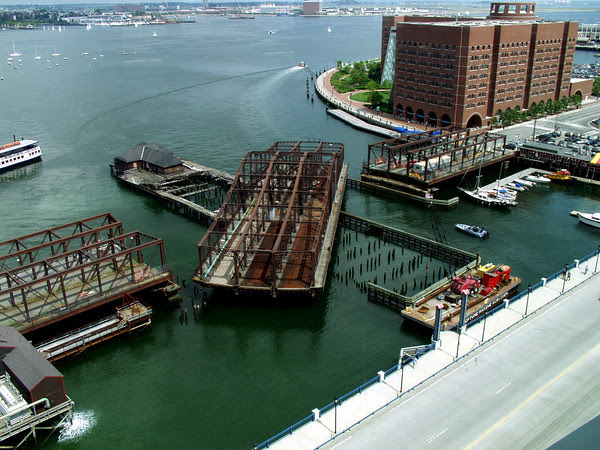 The City of Boston has taken its first steps toward taking down the century-old Northern Avenue Bridge, which the U.S. Army Corps of Engineers and the Coast Guard have warned is in a state of severe deterioration. The bridge will be moved in six large pieces by barge to East Boston. However, removal of the bridge does not mean it will be demolished. Key decision makers at City Hall have expressed interest in considering a preservation-oriented solution, but have not yet decided on the bridge’s long-term future. Before any work on the bridge can begin, the City must obtain several federal, state and local authorizations, including the U.S. Army Corps of Engineers and the Massachusetts Historical Commission. Each of these agencies have issued official correspondence and are seeking public comment. Now is a critical time for YOU to call for a preservation solution that returns the bridge to Fort Point. From now through March 1, you have the opportunity to share your opinions and concerns about the future of the Northern Avenue Bridge with key decision makers. Your input is essential to this process. The Boston Preservation Alliance is providing the proposed language and contact information below and on The Boston Preservation Alliance, but don't hesitate to modify your message as you see fit. Your correspondence will be received by the U.S. Army Corps of Engineers and the Massachusetts Historical Commission and filed as part of the required public comment period associated with both federal (Section 106) and state (950 CMR 71.07(3)) review. Please join The Boston Preservation Alliance, The Friends of the Northern Avenue Bridge, The Fort Point Neighborhood Association and others in voicing your support for the preservation of the Northern Avenue Bridge. View Walk Boston's letter of support. I write today regarding Boston’s Northern Avenue Bridge in response to the U.S. Army Corps’ “Public Notice” (and associated Section 106 Review) and Massachusetts Historical Commission’s “State Register Consultation” (950 CMR 71.07(3) ) and your invitations for public comment. I feel strongly that the Northern Avenue Bridge is an integral element of Boston’s culture and environment which should be preserved. The bridge is an important, character-defining feature of the Fort Point District and the city as a whole. Its loss would mark a significant degradation of the historic neighborhood and the historic features that are so important to defining the City of Boston. A repaired bridge is the best solution to the city’s needs. It can continue to be a city icon while supporting transportation needs to the growing Seaport area and would be a far preferable solution to a new bridge. A restored bridge would represent the city’s unique character of blending old and new and can become a revitalized city feature. I urge both the U.S. Army Corps and Mass. Historical Commission to require a Memorandum of Agreement that places the proposed dis-assembly and move of the bridge within a larger framework for the reconstruction, repair and return of the historic bridge. Placing the bridge in East Boston with no additional steps would not meet the requirements for treatment of a historic structure of this significance. I request to be considered a “consulting party” and informed of future meetings, discussions, and actions on the bridge. We urge your agencies to hold public hearings on the matter.